Photographing the night personalities of the world’s great cities is always a pleasure. Night photography doesn’t have to be about major landmarks and icons. 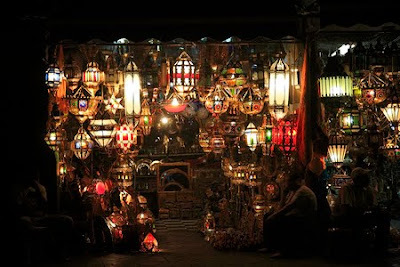 This stall just of off Marrakesh’s famed Djemma el Fna is not your average lighting shop. I was tempted as always to bring a lantern home from Morocco. The trick of course is how to get it back in one piece. What is the most difficult to transport item you’ve brought home from your travels? Love the shot! I wish I was able to go out at night and shoot the Marrakech souk scene, but I had my very young daughter with me at that time. That's a lovely picture. Very Arabian Nights. Great question. Ceramic bowls (definitely) from Italy, Portugal, Spain and Thailand. I have become an expert at packing several into my knapsack at a time. Once, I carried seven large ceramic bowls home from Europe in my carry-on luggage. That is a gorgeous shot! THe hardest thing I've had to trasnport was a handcarved mirror from Mexico. It got cracked but its so beautiful that I hung it up anyway. gorgeous shot of the lanterns! Jen, Monna, Flygirl--I'd love to know your techniques for bringing them home. Kaotic, Ana and Lynne-Thank you. Great night shot - can hardly wait to go to Morocco. I've transported two awkward objects home - a very large black pottery vase from Oaxaca, Mexico, though it was long enough ago they let us carry it on the plane. Not so sure that would happen now. Also hitchhiked/backpacked from Istanbul to Geneva with a 6'X4' Turkish rug. Sick of the thing now but it has so much history that perhaps my family can wrap me in it at the end.